Today, the topic which we are going to discuss is the 'General Procedure to Square any number'. Earlier we discussed about the squaring of numbers near base, however, general procedure is another nice formula to do the squaring and is applicable universally. The method or sutra is "Vertically and Crosswise", but here it is used in a different sense; based on a procedure known as 'Dwandwa Yoga' or 'Duplex Combination Process' or 'Duplex'; denoted as (D). and so on. This is called Duplex. Now, let us come to original question i.e. how to square a number. And the square of any number is just the total of its Duplexes. Equivalent Algebraic Expression is: (10a + b)2 = 100(a2 ) + 10(2ab) + b2 . 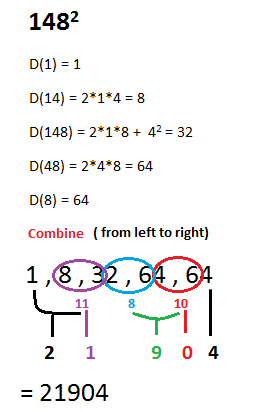 This method can also be explained by multiplying a number by itself using the general multiplication method. Note :- If a number consists of n digits, its square must have 2n or 2n-1 digits. We hope this method will help you in squaring of any number quickly. If you find this difficult, you may use another method which we have discussed earlier( Squaring numbers near base ). Every method will become easy with practice. In our next article, we shall discuss about the cubing of the number.